Our Superintendent, Patricia Sullivan-Kriss hosted another SBPLI meeting at Hauppauge and invited school representatives from Long Island districts that do not participate in FIRST. Team 358 officers showed past robots and discussed the games they played, demonstrated our 2008 robot, and described the FRC program and their experiences in the program. We held our first officer then general team meetinsg the second week of September. General membership meetings covered what FIRST and the robotics program is all about and gave the newest members an idea of what to expect. We also covered more mundane topics such as the Fall meeting schedule, club dues, fundraising, etc. We planned to meet every other Thursday through the Fall, host several SBPLI workshops, help with the SBPLI 60 over Sixty Gala fundraiser, and attend off-seasons at Deer Park and Brunswick. Our general meetings focused first on stripping out the wiring on our 2004 robot as well as the unused sensors and wench to rebuild it for loan out to Bethpage for use at the upcoming Deer Park Invititional. 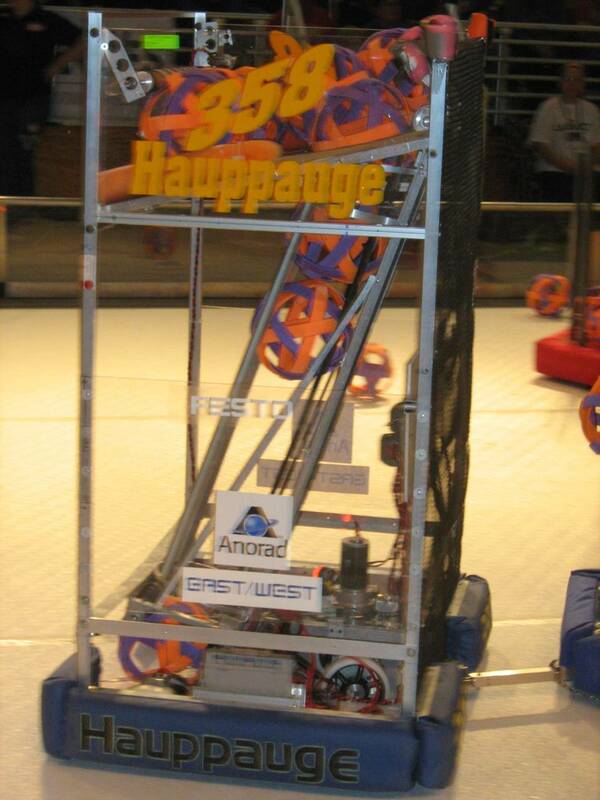 Everyone took turns driving our 2008 robot and hurdling track balls. We plan to held several smaller topic specific meetings on specific aspects of robot development: programming, drivetrain review, and electrical wire stripping/crimping/soldering. Homecoming day was the first weekend in October, very early this year. Our 2008 robot was a float in the Homecoming parade. 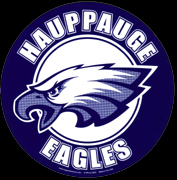 We gave out candy to children along the marching route and afterwards sold Hauppauge Eagles car magnets to people in the stands. We had a table decorated with gold and blue lights powered off a 12v battery, and balloons taped to the table edge. Homecoming is always such a great community gathering. Three of us attended an Inventor workshop hosted by West Islip on November 10. Then, joy of joys, before Thanksgiving we got notice that the 2009 control system was being shipped to us early. We received it the next day and spent the next several weeks learning a thousand ways to bollix it up. 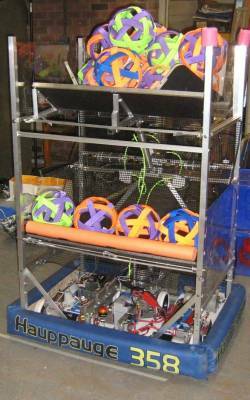 We finally rebuilt the 2003 crab drive robot with the extensive help of Pat Hughes and his garage, mounting the new electronics as a demonstration platform. It debuted at the LabVIEW workshop Mr. McLeod organized with LI/NJ/PA National Instrument representatives at Farmingdale State College the second weekend of December. Also in November, Mr. McLeod was sent to Texas as the SBPLI representative for one day of training and talking to developers of the new control system. Hosting a four hour programming workshop for beginners, sandwiched between SAT testing in the morning and Homecoming parade in the mid-afternoon. Mentor Tom Boehm from Pat-Med gave the workshop lecture using EasyC to demonstrate both generic graphical programming and WPI-based C code. The 2009 control system will base it's C/C++ programming on WPI library, so the C code will be quite similar in concept. We then used our Vex robots for a practical hands-on session. 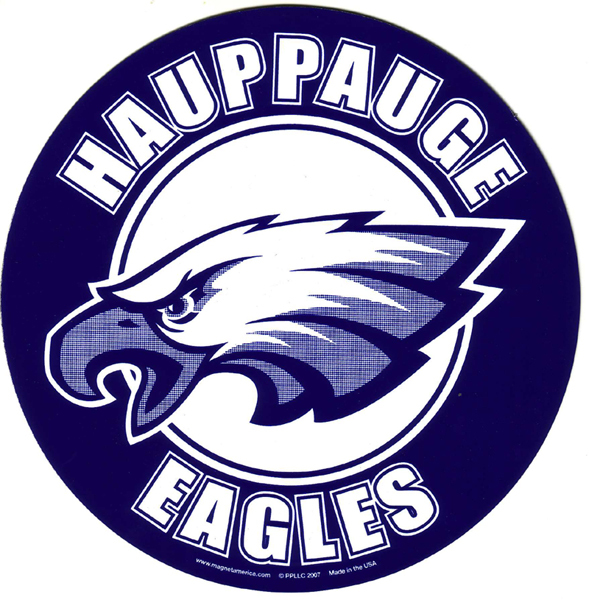 Hosting an SBPLI fundraising forum at Hauppauge for local teams (~8 or so) to exchange ideas on what works, what doesn't. Janet Anderson our LI-FIRST Regional Director facilitated the discussions and collected lists of ideas. LabVIEW fundamentals hands-on workshop was held at Farmingdale State College with guest trainer Robert Berger of National Instruments teaching 22 teams, from Long Island to New Jersey, how to write generic LabVIEW programs with Mr. McLeod assisting. 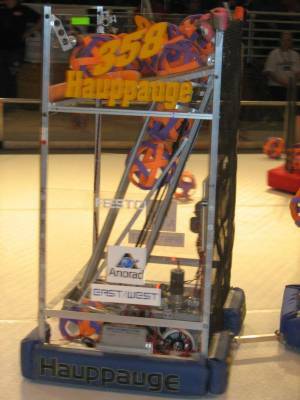 We had our 2003 robot with the 2009 control system installed. The 2003 crab drive was rewritten in LabVIEW and we had the camera streaming video back to the PC dashboard. Several teams had their early control systems on demo boards and we helped debug issues they each had. Our annual KOP Workshop held a week after Kickoff at Farmingdale State College after everyone had received their new control system hardware. About 20 teams had tables to unpack and setup their new control systems for help with wiring and updating the firmware. 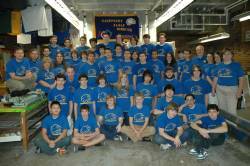 We had a large group of Hauppauge mentors and students, as well as, members of the Westbury and Southold teams. We split the group into two concurrent sessions with a second programming group using a lecture hall for hands-on LabVIEW FRC specific programming, where everyone first wrote a program from scratch then discussed the default Basic/Advanced templates provided by FIRST. Afterwards, the groups joined again and downloaded programs into their newly assembled control systems. Two of our students helped out at the SBPLI 60/Sixty gala fundraiser honoree dinner by escorting some of the 60 honorees up to the dalis for their personal award presentation. We delivered the retrofitted robot to the Bethpage rookie team to get to know and practice with a couple of weeks before the Deer Park Invitational. Bethpage practiced driving it in their hallways. The slick floor made turning very fast, especially while holding the extra weight of a homemade Trackball out in front. We helped with the Deer Park field setup as usual the Friday afternoon and night before, where we were responsible for the field electronics. There were some gotcha's with different revisions of the Arena controllers statusing different ways that kept us until 10pm or so, but everything ran flawlessly on Saturday. Several robots had early issues, but all were eventually running. Our robot's grip tape had all worn away and replacement tape turned out to be too slick to hold the Trackball, so it was difficult to play our usual game. A lot of freshman drivers took turns at the controls, and one new driver succeeded in taking out a complete center panel on the field. We had three rookie teams playing with loaner robots from Hauppauge, Pat-Med, and West Islip: Bethpage, Cold Spring Harbor, and the Wheatley school from Old Westbury. The Bethpage robot blew one set of wheel bearings at the end, but since it happened on an omniwheel it didn't cause any problems. Luckily, the omniwheel rolls fine in any direction and orientation and didn't even noticable affect the driving. While one group of students competed in the Deer Park event with our 2008 robot, and Bethpage competed with our 2004 robot, we also had the 2005 robot playing with the young trick-or-treaters at Safe Halloween back at the high school. All events went very well, but it's a good thing we have so many operational robots. After that busy weekend we prep'ed and delivered the base of the 2007 robot to the Cold Spring Harbor rookies to learn the sub-systems and have a working robot to experiment with before they get their first Kit-of-Parts in January. The base was reworked to open up and expose all the mechanical, pneumatic, and electrical sub-systems for easy instruction. Our last Overdrive off-season competition was at Brunswick Eruption 7 a week later. The grips on the robot arms were retaped with better gripping material and was back to normal operation. We finished as the 8th Alliance Captain, but joined forces with team 555 and Team 2070 falling in the quarterfinals. Ben Solaski was our champion eater at the Evil Sundae contest. Our fundraisers started with car magnet sales at Homecoming the first weekend in October. We made quite a bit of cash selling scrap aluminum and cable to a scrap metal dealer who came to our shop, weighed and loaded the metal, then paid us in cash. Our standard Oldies concert continued to bring in money the second weekend of November. Boxes of Hex Bugs and candy were sold. The Monday night after our 2009 robot was shipped we held a dinner fundraiser at Famous Dave's where they gave us a percentage of dinner sales from people who gave them a coupon from our team. Team members handed out coupons ahead of time to family and friends as well as in front of the restaurant that night. Build season began with the Kickoff announcement of FIRST Lunacy, a game played with slick wheels on a slick floor, every robot pulling a trailer goal just slip-sliding away. We met every night to strategize, plan, and prototype, but didn't begin meeting on the weekends until the end of January. The final couple of weekends we met on Sundays. We had regular visits from Mt. Sinai and Smithtown programmers for help with the brand new control system. Mr. Hughes retired Miller Place technology teacher and former FIRST team lead of Team 514, setup permanent shop as our mechanist mentor and was a huge (no pun intended) asset and principle in the design of our first swerve drive module ever (if you don't count Vex swerve modules). Our robot this year is designed to have a broad front to spread the front wheels as far apart as possible to improve turning, but in the back is a single swerve unit with wheels set about a foot apart for stability. So we have a three wheel drive independent system, with each unit using a CIM motor on an AndyMark GEM planetary gearbox. We optimized the middle of our robot to collect and ferry empty cells from the mid-field player position to the corner player positions to exchange them for 15 point super cells by tossing them in with a pneumatic flipper. The top of our robot also has a pneumatic dumper that can be used with the 7 balls allowed at the start of a match or added to by human player top loading. Controls were interesting because with standard USB game controllers available we choose a steering wheel/foot pedals setup for driving. A potentiometer on the swerve steering made it steer just like a car, but getting it calibrated destroyed two pots by twisting them and all the wiring around and around until they ripped out. Once when we were setting up the failsafe limit switches to prevent an incident such as this from happening. Each of the three drive wheel systems had an integrated Grayhill 61K128 encoder to monitor wheel rotations as well as a free-rolling following wheel that allowed us to detect drive wheel slippage and provide traction control. The follower wheels were 2.75" Vex omniwheels with quadrature Vex wheel encoders mounted with spring tensioners to keep them on the floor. Our first competition was the NYC Regional. Our drive team this year was Jimmy McMahon-base, Steve Ferraro/Evan McLeod-ball manipulation, and Nolan Conway-floor shooter/Ben Solaski-standing shooter. The students had already decided on a redesign based on what several of them saw when they went to the NJ first weekend Regional. A Popular Science reporter interviewed our students unpacking the crate and followed our progress throughout the event. However, since the redesign involved changing the top completely and this year's Fix-It windows were work at any time before or after each regional, they played with what they had and saved the reconstruction for Saturday afternoon. It took awhile anyway to work out what the driver needed to fully control our rear swerve drive. We were not chosen for Finals, so we took advantage of the whole afternoon to chop out all that we no longer needed and weigh the leftovers to see what our weight budget was to add a ball collector/shooter. 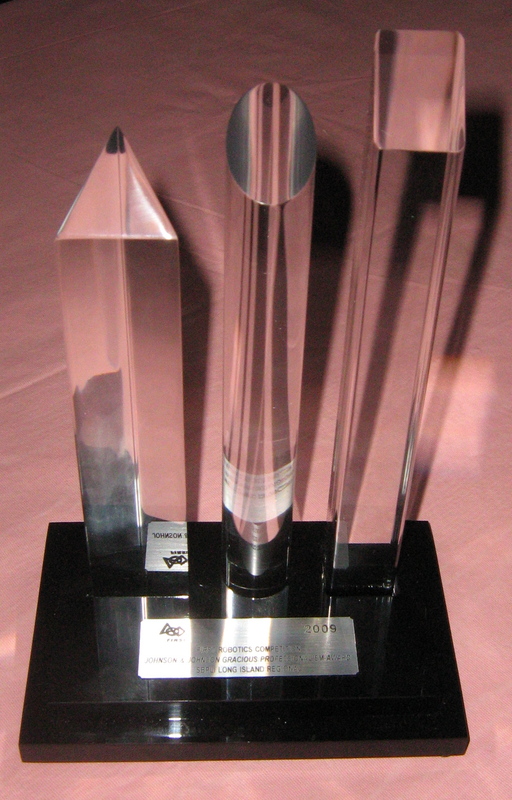 Several team members were interviewed throughout the competition by a writer for Popular Science magazine and appeared in an online article. SBPLI celebrated it's 10th anniversary (ours as well) and requested several of our old robots as static displays to see how the robots have differed over the years. We had our robots back to 2003 operational, but since they are working robots and constantly in use, they needed cleaning up and reattached skins. 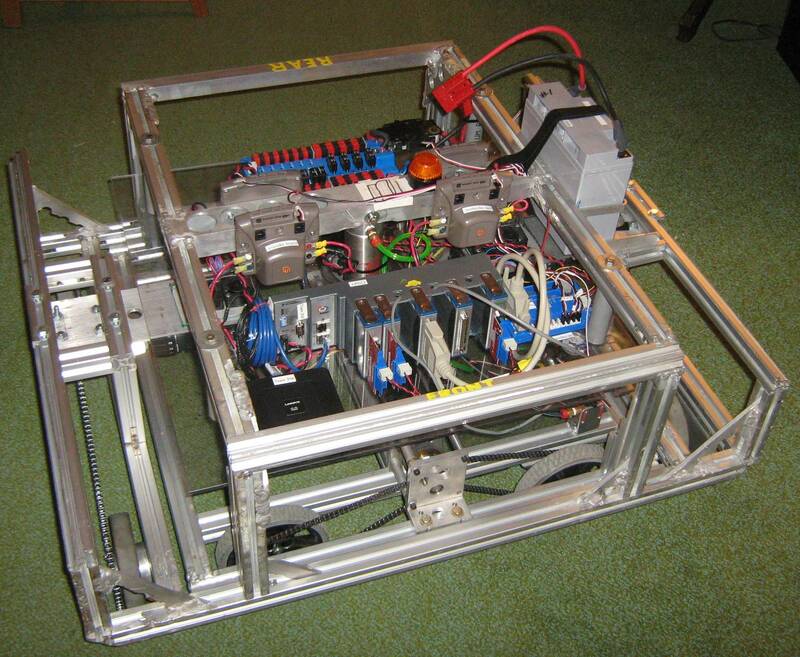 We had older robots as well, including the original 2000 robot, but it was no longer complete and operational without a lot of work and spare electronics. One robot was still out on loan to a rookie team. We rebuilt our robot adding a ball pickup mechanism that worked great! We ended as the 7th Alliance Captain with Teams 514, Miller Place, and Team 28 Pierson HS, but finished in three Quarterfinal matches. We were awarded the Johnson & Johnson Gracious Professionalism trophy for our season workshops from hosting the fundraising forum and LI superintendents to running the control system workshops, as well as, our mentors spending most of Friday with Sachem after their robot burst into flame. 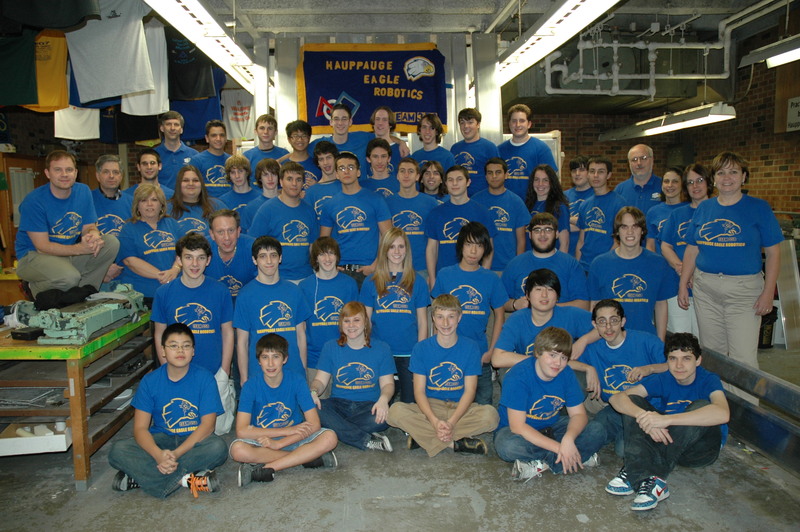 We continued working with Sachem after the regional to improve how the motors and software control the gyro. We had quite a few team mentors and parents volunteer at SBPLI this year. Mr. Solaski and Mrs. Frank volunteered as Software Inspectors, and Mr. McLeod was Control System Trainer but got drafted as Field Tech. Mr. McLeod and Mr. Hughes volunteered for field setup. Mr Hughes and Mr. Richter helped with field teardown, and Mr. Hughes also transported the SBPLI machine shop to and from Hofstra. Mrs. McLeod was a field queuer. Mr. Richter transported three of our past robots for a static display of SBPLI robots through the years. They barely fit into his giant van. On to the Championship in Atlanta! This year our shipping was done a little differently because we missed our regular shipping contact, but everything should be fine next year. We packed heavy items like our batteries, chargers, toolbox and cart in the robot crate which brough the shipping weight to 570 lbs. Then we used our checked bags to bring still more. We travelled as lightly as we could to save costs, so our pit was pretty bare this year with but a single eagle banner marking our back wall. It gave us a good feeling for how cheaply we could pack in preparation for potential lean years sometime in the future of every team. We took the school bus to La Guardia, AirTran to Atlanta, Metro to the Omni Hotel (and last year's tornado that kept us from the Omni didn't reoccur). 25 students and and 8 adults traveled with us. Two additional adults showed up later for a shorter stay. We ate at the Grand Hong Kong Buffet, the Metro Dinner for Karioke, and the FIRST Wrap Party the last night. We did a lot of work tracking FRC team registration this year and cross-correlated all the FRC teams back to the original 1992 teams.